Kohler Co., a global leader in kitchen and bath design and technology, was chosen by the Environmental Protection Agency’s WaterSense program as the Manufacturing Partner of the Year for the second time in as many years as the award has been in existence. EPA launched the WaterSense Awards program in 2008, honoring work performed during 2007. Kohler received the inaugural award in 2008. The Partner of the Year awards recognize WaterSense partners who help advance the overall mission of WaterSense; increase awareness of the WaterSense program in a measurable way; and demonstrate overall excellence in the water-efficiency arena. Kohler prominently displays the WaterSense logo in product literature, on its Web site, at trade shows and regularly conducts continuing education courses on water efficiency. Moreover, the company’s spokesperson, Ed Del Grande of Ed the Plumber on the DIY Network, tours the United States talking about high-efficiency toilets, conducting interviews on reducing water use, and promoting WaterSense for audiences at national trade shows. In August 2007, Kohler signed on as a Presenting Sponsor of the new IMAX film, Grand Canyon Adventure: River at Risk, from MacGillivray-Freeman Films. The film, released in March 2008, speaks powerfully about how civilization is impacting the Colorado River, and what can be done to reduce our use of water. Kohler hosted more than 30 IMAX events around the country throughout 2008, and invited guests to view the movie and learn about the water-conserving products from Kohler. This sponsorship of the movie signaled a massive effort by Kohler to promote the message of water-conservation and WaterSense directly to homeowners. Tens of thousands of homeowners were introduced to the WaterSense program via these events, and more than 90 million media impressions were garnered about the film. Kohler built upon its successful support of WaterSense in 2007, and into 2008 introduced new programs, products, media opportunities and promoted the company’s recognition of the inaugural EPA WaterSense Partner of the Year Award. During 2008, Kohler worked to convert all of its lavatory faucets to adhere to the WaterSense guidelines, with full conversion completed in the first quarter of 2009. SaveWaterAmerica.com – a viral site devoted to water conservation – was developed by Kohler in 2008, and officially launched in January 2009. The viral site educates homeowners about WaterSense plumbing products, and provides useful information to reduce their water consumption. Founded in 1873 and headquartered in Kohler, Wis., Kohler Co. is one of America’s oldest and largest privately held companies. Kohler is a global leader in the manufacture of kitchen and bath faucets, sinks, engines and power generation systems, cabinetry, tile and home interiors, and an international host to award-winning hospitality and world-class golf destinations. 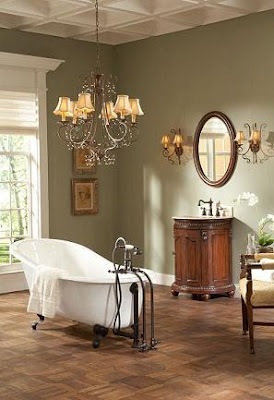 Kohler Sinks and Kohler faucets are some of the best and most popular products made in the industry according to eFaucets, the online leader in Faucets, Sinks and Fixtures online. With about 75 percent of the Earth covered in water, it’s easy to assume that we’ll never run out. People living in areas where water is scarce, however, already understand the importance of conserving this precious resource. The good news is that we can all make a difference just by making a few small changes to our daily habits. When it comes to saving water in the kitchen, a few small steps can make a big difference. Consider these tips for reducing your water consumption every day. Capture running water while waiting for the temperature to change: this excess water can be used to water plants. When washing dishes by hand, use as little water as possible. Use only the required amount of dish soap and put the dishes in a rack to rinse them all together and reduce rinse water. Be sure to use short bursts instead of letting the water run when rinsing. When you do use the dishwasher, use appropriate water and energy efficient settings. Keep a container of drinking water in the refrigerator. With cold drinking water on hand, you'll waste less than you would while waiting for the faucet to change temperature for each glass of water. Do not defrost frozen food with running water. Use the microwave or defrost in the refrigerator. When cooking, use only the amount of water required; this reduces the amount of water wasted when straining. The Water Saving Tips are brought to you by our Featured WaterSense partner KOHLER. The EPA named KOHLER faucets as the EPA's WaterSense Partner of the Year for 2009 for their efforts in designing products to save water. KOHLER Touchless faucets with Tripoint technology have an automatic shut-off, so water runs only when the faucet is in use. They also have highly accurate activation sensors, which conserve water by keeping false activations to a minimum. Kohler Touchless entertainment faucets with 1.5gpm aerators offer a substantial water savings over traditional 2.2 gpm faucets. 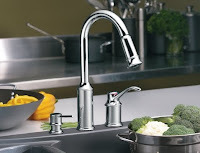 And because they feature Touchless technology, these faucets save water with precise activation. Aquifer water filtration systems with Kohler's Wellspring® and Carafe beverage faucets are your source for refreshing, purified water. An environmentally friendly alterntive to bottled water, Aquifer® water filtration systems combine with KOHLER beverage faucets to provide refreshingly pure drinking water. 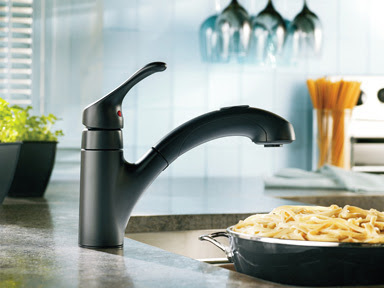 Eliminate all the hassles of home-filtered water. When you install an Aquifer water filtration system, you leave behind messy installation, meager water flow or lack of style and finish selections. Choose a lead-filtering system or a single-stage system to reduce dirt, rust and chlorine.